I scrolled down my Facebook feed last night, image after image of comments, photos, memes about a fresh tragedy in Charleston. Nine souls in heaven now, countless beings writhing in anguish because someone thought it was okay – or necessary – to kill in order to try to control their environment. 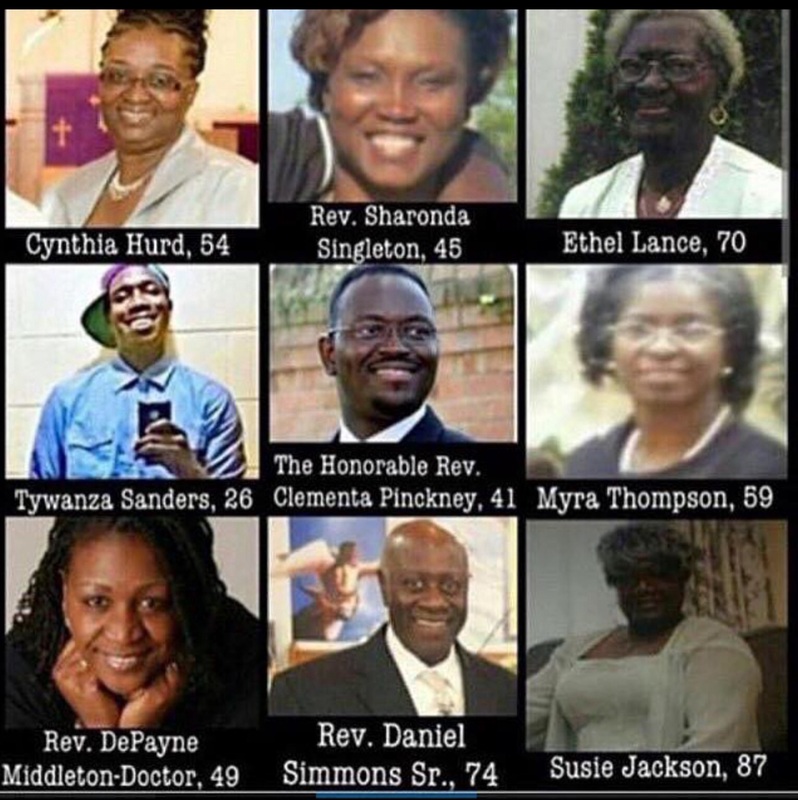 Cynthia Hurd, Reverend Sharonda Singleton, Ethel Lance, Tywanza Sanders, The Honorable Reverend Clementa Pinkney, Myra Thompson, Reverend DePayne Middleton-Doctor, Reverend Daniel Simmons, and Susie Jackson have all left this world at the hands of another person. Beautiful people; this world misses them. Dylann Roof thought he had something to protect from them. I see posts by my dark-skinned friends and wonder if their feelings about me have changed. I look pretty darn white. I’m afraid to comment. I value their friendship; I love them, even the ones I’ve never broken bread with. I don’t want to lose them. I agree with them. I wonder if they would believe that. I sit in silence. That’s my attempt to control my environment. I see comments by Charleston citizens of my own apparent ethnicity, heartbroken that someone violated the ‘charm’ of their city. Much of that ‘charm’ was built through the theft of the sweat of slaves. Can I tell my friends that some of my own ancestors landed in Charleston, hundreds of years ago? There’s a street there named after my mother’s family. They went on to own a plantation in Alabama. I’ve listened to relatives pine about lost grandeur, wistfully flipping through photos of elegant sitting rooms and rolling lawns. I’m riveted by the photos of the slave cabins (no one calls them that anymore; now they’re ‘out-buildings’). I’m afraid to comment. I value their friendship; I love them, even the ones who have hit me repeatedly. I don’t want to lose them. But I don’t agree with them. I wish I could think of something to say that would open their minds. I sit in silence. Gender, Race, Nationality, Species, for goodness’ sake. Whatevah. But whatevah matters. Karma. Our state of mind, our actions, bring us to our present conditions. Our world is our mirror. Everything we see and experience reflects our own state of mind. Thank goodness it’s fluid and mutable. I believe in reincarnation. Not because it makes sense, but because of what I’ve seen firsthand (out of body experience in 1999, dreams beyond enumeration). In recent years, I’ve explored regression hypnosis. I wanted to know if I’ve been abducted by ‘aliens’. I wanted to know how far back my Buddhist roots go. Instead of plunging back into memories of darkened bedrooms, mysterious glowing lights and little people with big eyes and elephant-hide skin, or sitting in caves in the Himalayas, I got histories beyond this world. In every session, my mind has carried me to worlds so unlike this one that description strains possibility. I’ve been a humanoid aquatic being with golden and blue skin that flowed in rippling ribbons around my legs. I’ve been a spindly, withered being that buried himself deep in sand so he could send his mind to other bodies in other universes in order to try and open minds, teach. I’ve been a pilot of a starship trying to blast through a crusty yet etheric shield around earth – eons ago. I’ve been a young goatherd living in remote mountains who left home to travel with the star beings who visited regularly. I’ve been a fat old woman who ran a boarding house in a post-apocalyptic America-like place, having lost all family and friends and living in a neo-agrarian society without even a post office. It’s enough to make me want to write Science Fiction, because I doubt anyone might believe they’re my memories. As if it matters. It’s enough to make me wonder how humans can be so confused that we think we’re not the same, just because we look different or hold different beliefs. And yet, each time I return to this waking life I marvel that I can be both Leslee and all those beings. If I can be all those beings, then I can also be a person killed in a senseless shooting. Or the person firing the gun. I try to keep my vision focused on the facets of the mirror that please me, wishing to love and share and cherish others. But the hateful glimpses keep popping into my peripheral vision. There’s some house-keeping to be done. Since I was a little kid growing up in 1960’s Alabama, I’ve been confronted with racism ranging from subtle to terrifyingly flagrant. It frightens me to the core. If humans hate each other because of culture and skin color, what’s to protect me from the hatred of others? If I don’t even identify myself as human, how can I walk in this world without fear? In this life, here I sit as an overweight white female, trying to learn to accept it, even to love it; trying to learn to love myself. Somehow, I pray to believe, that effort works towards bringing unconditional love to this world. Ever since I was a little kid, I’ve hated my white skin. Not because I’m racist; because it just looks like the wrong skin. It’s not the skin I was expecting in this life. I gaze upon people with golden caramel-colored skin or deep coffee-colored skin, smile at their radiant beauty, and pray to have my skin back in my next life. It might be African, it might be Tibetan or Mayan, I don’t know or care. Just please not this splotchy pink translucent stuff. I can’t explain it; I can only confess it’s where I’m at, and I want to move to a better place. For now, I have to deal with this white skin. When I was a little girl, I used to check regularly to see if my missing genitalia was finally growing in. I’m not a lesbian or trans-gender; I just thought I was supposed to be a guy. When I got my first menstrual cycle, I sobbed in despair; I was doomed to life as a female. I knew instinctively at that young age that to be female in that present world and time meant to be perceived as less-than, dis-empowered. For now, I have to deal with this female gender. When I got pregnant, I gained 75 pounds. Twenty years later, I still carry 30 of them. I don’t recognize myself in the mirror. Which is, of course, the root of the situation at hand. Thank goodness I believe these transient conditions will pass. Thank goodness I can see the world changing before my very eyes. Thank goodness I believe we can come through this mess of current events with a deeper understanding of ourselves and how we connect and create our realities. Because I can’t wait to fall in love with what I see in the mirror. I don’t want to live in a world of self-hatred, with constant reminders flashing before me on Facebook and the news. To accomplish that, I must learn to love others as myself. It’s a process. I don’t want to feel separate from others. I don’t want resentment, anger, despair. I want love, peace and community. To accomplish that, I must learn to love myself, so my mirror-world doesn’t show me the horror of Dylann Roof’s actions. Dylann Roof hates himself far more than those he killed. That’s how he can stand expressionless while listening to loved ones of the dead plead with him to repent. He doesn’t feel worthy of salvation; his despair runs that deep. Does my despair run that deep? Does your despair run that deep? Can I accept my own circumstances – the world I’ve created – and be willing to surrender my wish to control, protect, preserve? Am I willing to insist on love at any cost? When I remember that this is just one life, just one world among countless universes, the conditions I grasp with my might-as-well-be-skeleton-hands dissolve and waft away like strands of a spiderweb in a soft breeze, like a forgotten dream. Because I have work to do, we have work to do. You are me. I am you. I love you. This matters. Please don’t shrug this off and say, “whatevah”. In every moment we make choices that lead us along our path in this world, and thus we choose what we will next see in the mirror of our world. Please help me remember in those every moments, that we come from boundless love abiding in stillness and peace. We just got a little bored and decided to incarnate. We don’t have to create pain. Please, let’s do this together. Thank you – please accept my deepest gratitude. All that…. Spot on, Leslee. The gender thing is weird isn’t it? I find it helps to remember that everything is energy. With this in mind skin color and gender are just properties of what we are at the moment. Just like putting on clothing! But it does tend to define the limited world around us, and shapes how others interact with us. Troy, thank you for this! I feel such a deep sigh of joy and relief to hear these words spoken to a receptive crowd and made available to so many people. Thank you for sharing this! I have a better understanding of Tesla now. The more he understood energy, the more alienated he became from this world. This solution is actually very, very simple. Google “colin patrick flaherty youtube” author of “Don’t make the black kids angry” see the real videos and playlists that reveal the real black experience in today’s america…You can’t dispute or refute the proof that these videos present!!!! !